Ellen Doyle (b. 1950) became an activist during her freshman year at Wellesley College. She joined Students for a Democratic Society (SDS), participated in anti-war protests and started a feminist consciousness raising group on campus. She transferred to Northeastern University and decided to pursue a career in law “to change the world through litigation” (Doyle, 2012). She graduated from Northeastern University Law School in 1975. “There were a lot of openings for protecting rights under the laws, and that was an exciting time to be a lawyer” (Doyle, 2012). Ms. Doyle and her husband moved to Pittsburgh in 1975. She provided pro bono services for the local chapter of the American Civil Liberties Union (ACLU), including a Title IX case that changed the practice of excluding girls from Kiwanis conventions. Ms. Doyle was then hired as executive director of the ACLU and litigated First Amendment cases, protecting people’s right to speak, to assemble and to march. She saw the ACLU as providing a deterrent to entities engaging in activity that’s unconstitutional. 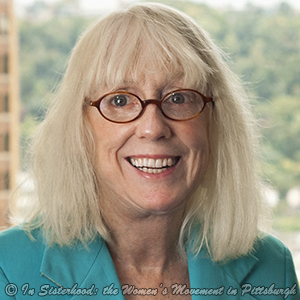 As a staff attorney for the Pennsylvania Human Relations Commission, Ms. Doyle was involved in the implement phase of a school desegregation plan for Pittsburgh. She also successfully represented women who wanted to be miners and did community education about the new sexual harassment guidelines. Ms. Doyle went into private practice in 1982. She is a plaintiff’s lawyer and advocates for civil right and civil liberties. She’s successfully sued banks, insurance companies and financial institutions on behalf of little people. She represented the Highland Building against Operation Rescue, an anti-abortion group, after their protestors used tactics to interfere with abortion clinics operating in the building negatively impacted other tenants in the building. Ms. Doyle served on the board of Persad, Pennsylvania Abortion Rights Action League and the Women’s Law Project. She participated in local and national marches in support of both the Equal Rights Amendment and reproductive rights.